We’re swiftly approaching the end of the year now, and I’ve been thinking on how I actually want to make some effort to finish off some projects that have been started this year, so that I’m carrying over a minimum of bare plastic, though this hasn’t actually seen much fruition this week! But you should all probably expect this by now! So what have I been doing since the immensely productive week last week? Well, not a great deal! First of all, let’s talk about my board for Armies on Parade this month. I’ve been trying to get the effort to paint this bad boy for pretty much two weeks now, having sprayed it Zandri Dust and pretty much done nothing else! While I was off, I painted the cracks with Naggaroth Night, and the metallic circles there with Warplock Bronze, but that had been the extent of my work on the thing really. So after casting about for some inspiration, I recalled that Duncan has done a video on exactly what I’m trying to produce with the exact board! I’ve therefore decided on a bit of a scheme for it, and have now painted all of the paving stone areas with a mix of Karak Stone and Baneblade Brown – that is, some are one colour and some are the other, mainly to add interest. I’ve also shaded the metal areas and all of the skulls with Agrax Earthshade, which alone has allowed me to feel much further along with it than I have been! Parade Day is less than two weeks away now, though, so I need to make sure I can actually pull my finger out with this!! At least I have some Tomb Kings to put on the board, and the main feature is my Stormcast, which of course have all been finished already! I still have no illusions of winning anything, but I do think my army can look quite effective when it’s all on the board there, so we’ll see! The Centurion has been upgraded to a Chaplain, who is wielding a plasma pistol (+15 points) and crozius arcanum (+15 points) Total: 115 points. I’ve still got the Contemptor Dreadnought waiting in the wings, but that’s roughly 200 points from what I remember, so I’m hoping that by the end of the year I will be able to have 1000 points ready so that I can start playing games with them, so stay tuned for that! I’ve had these other five marines waiting in the wings since I built up the five Novamarines at the beginning of the year! 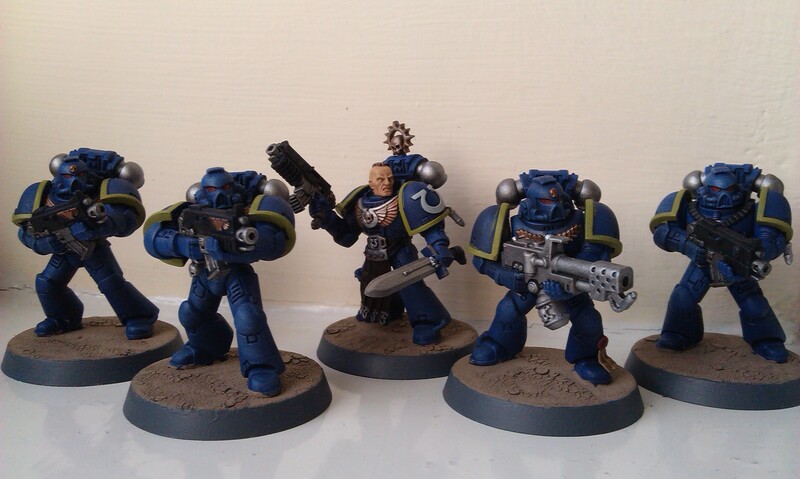 So I’ve taken some time to kinda kitbash some really fancy-looking marines together: most obviously, the sergeant out front has got the power fist from the Devastator kit, and the power sword from the Ultramarines upgrade kit. That upgrade kit is widely-used for shoulder pads on the other guys, too. I’ve already talked about using Devastator parts on the missile launcher guy, who has been built up a few weeks ago. The only other bits are a right arm from the Vanguard Veterans kit that allows the marine on the right to wield his boltgun one-handed. I’ve also finally built up the apothecary that I’d started to work on months ago, but couldn’t find a right arm that I wanted. Well, once again the Devastator kit has come through for me, there! What an awesome and versatile kit that is! While I’m still on the subject of Ultramarines, I thought I’d share this picture that I put up on instagram last weekend – it’s the tactical squad I posted about last week, but arranged around the novel Nightbringer, which I did purely for a bit of fun, but has swiftly and inexplicably become my most-liked photograph on instagram in the history of me! The Genestealer Patriarch from Overkill is a lot of fun, even if it is the third iteration of this pose in, what, eighteen months – I should try to get my Space Hulk and Shield of Baal Broodlords together with him for a comparison… But it’s still a badass model, and I’m looking forward to getting it painted up along with the rest of my cult. As I said in yesterday’s blog, whereas I’ve dabbled with models like the Electro-Priests or the Grey Knights, I’m actually going to build a Genestealer Cult army, so that will be (eventually) three full armies for 40k. Hopefully, by the time I retire I’ll actually have them painted up, too! Finally, I started to build some more Tomb Kings last night, after winning some lots on ebay! I’ve got two done thus far, and while they are fairly simple to put together (the horsemen themselves have a body that’s all-in-one, so that’s useful) I’ve only managed this pair. I’ve had to leave the slotta bars on the horse feet, as the surface area is otherwise too small and I’d worry about them. I’m confident that I can built it up with basing material though, so they won’t be obvious! I don’t know if I’ll be pushing my luck to get even these two painted up for Armies on Parade, but it would be kinda cool… We’ll see! So that’s the extent of my progress for this week! I’m planning to focus my attention on the board, with the Alpha Legion marines for a bit of light relief, so hopefully in next week’s blog, there will be some exciting times to talk about!! I had the week off work this week, and it has been awesome for my hobby-time! Prepare for one of the most exciting and prolific painting progress blogs since I began this series back in January! To start with, it’s the Skeleton Warriors that have been featured in previous installments! These are the first Tomb Kings models that I’ve actually managed to finish, and while they won’t be winning any competitions any time soon, I’m really happy with them! That said, they are actually going to form part of my Armies on Parade display – my Stormcast will be invading Khemri/Realm of Death! I think I’ve mentioned some of it previously, but let’s talk about the scheme in its entirety here – mainly because I’ll probably forget otherwise… So the models were sprayed with Corax White, and the bone shaded with Seraphim Sepia. For the gold, I’ve used Balthasar Gold, shaded with Agrax Earthshade, and drybrushed with the new Skullcrusher Brass. The shields were actually more complicated than I’d expected: painted with Teclis Blue, shaded with Drakenhof Nightshade, and lightly overbrushed with Lothern Blue. I’ve then shaded them again with Agrax Earthshade, then finally overbrushed some Macragge Blue at the top near to the gold trim. The result is almost a blending look, though was arrived at pretty much by accident! 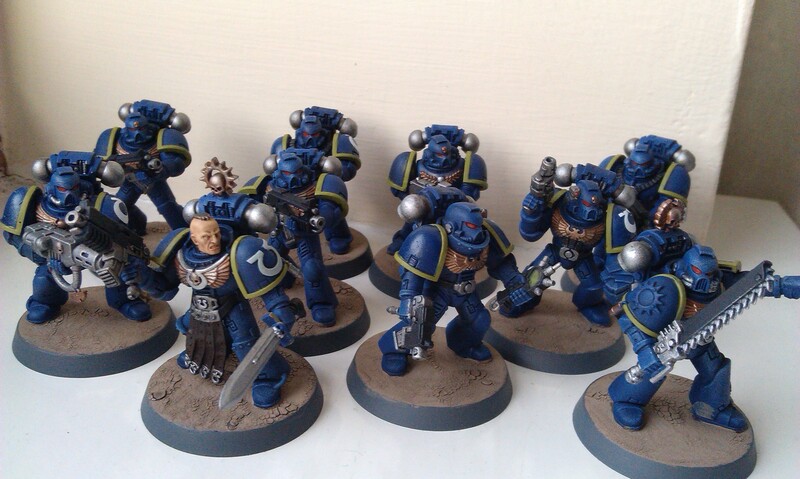 The headdresses were painted with Macragge Blue, and shaded with Nuln Oil. All of the spear hafts were painted with Dryad Bark and shaded with Agrax Earthshade, and the spear tips were done with Leadbelcher and shaded with Nuln Oil gloss, which hasn’t ended up with as glossy a look as I was expecting. I kinda like the idea of having a more obsidian look to those, so I might go over them again. The strips of cloth on the standard, and trumpet thing, as well as some of the shields, were basecoated with Rakarth Flesh, and then shaded heavily with Reikland Fleshshade – because I want them to look more akin to flayed flesh than cloth. Finally, the bases were painted with Blackfire Earth, which I’m upset to report my pot has dried out, so I had to mash it up with a lot of water to get it going. I think I’m going to have to invest in some more for all of the Tomb Kings I have, though! Also, the rims were painted with Dawnstone. 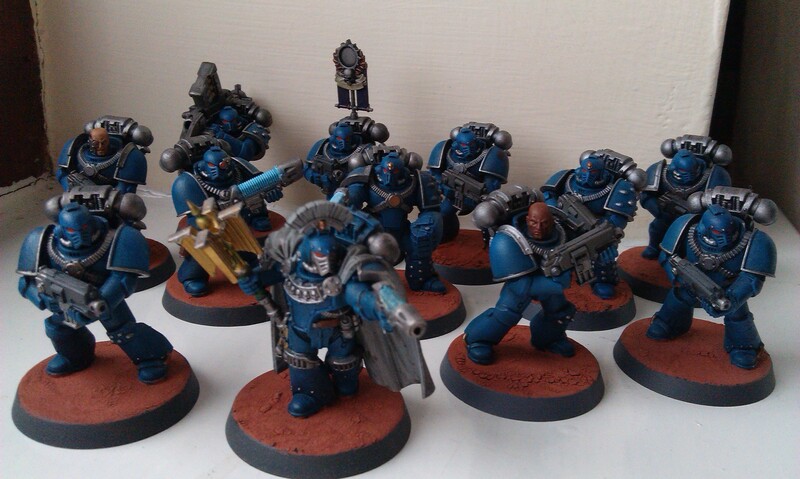 I’ve also painted up some more Horus Heresy legionaries, further expanding my Alpha Legion! I’ve actually merely finished them off, as the armour and some of the silver had already been started. But it’s always good to get things actually finished! Following the main scheme for these guys, the skin has caused me a lot of trouble. In the novel Legion, the marines are described as having coppery skin, so I’ve wanted to emulate this, but didn’t really have much of an idea of how to do that. 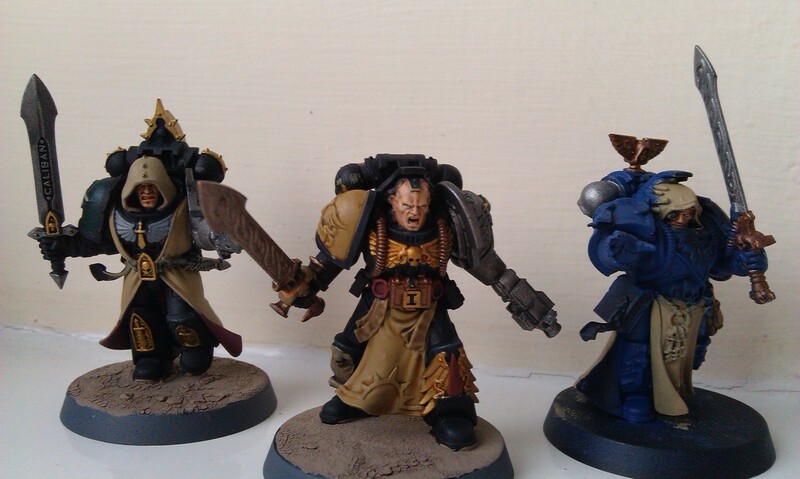 So, I initially painted their heads – lightly – with Balthasar Gold. You know, for literal coppery skin. I then went for a bit of an overbrush technique of Doombull Brown and Wazdakka Red in a roughly 2:1 mix. While this worked wonderfully for the chap on the right, the chap on the left didn’t seem to come out looking that great. So I went to the usual Cadian Fleshtone and lightly brushed that onto the one on the left, making him a bit paler than the other guy. But I guess it all adds for the variety! Again, they’re not going to win any awards up close, but I think they look pretty good when they’re in the middle of the other guys! I’m really happy with how my Alpha Legion has been growing so far this year, and while it has been fairly slow to get anywhere, I think that’s the best for me!! On Wednesday, I gave myself a bit of a painting challenge for the afternoon, seeing how far I could get with the unit of Vanguard Veterans. These are the guys, three of which I’d attempted to paint as Scythes of the Emperor, decided better of it, and stripped them before spraying them with Macragge Blue. At some point in this process, the finish on these models has become a bit rough and uneven, and I’m left with some chaps that are less than ideal, if I’m honest, but seeing as how I actually want my Ultramarines to be 4th company anyway, I’m treating these almost as practice miniatures – their armour is sufficiently detailed that I’m trying to make a good job of them with some different effects or whatever, but I won’t be too torn up if they turn into an absolute mess. 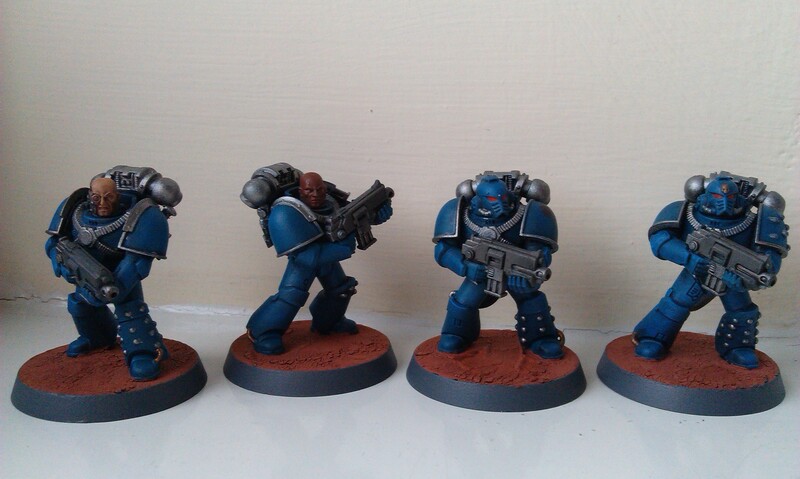 The five assault terminators that I’d started ages ago! I don’t know what it is, but these models just feel really horrible to paint right now, like the previous layers of paint were applied too thickly. If memory serves, I sprayed these with Macragge Blue and, while the original batch of space marines didn’t seem to be too badly affected, it feels a bit like that has obscured too much detail for me. Again, I’m really not happy with these, and if I do go down the route of an ultrasound cleaner, I’ll be throwing these guys in there as well. But to finish, I’ve been working on yet more space marines – it’s the second lot of ten from that first batch of marines I built up late last year! Including Captain Ventris and Sergeant Lysane! These guys have been a lot better to paint, and over the course of Saturday afternoon, I got them done. The gold bits I’ve done slightly differently to my usual scheme, in that I used Reikland Fleshshade to shade it, rather than Agrax Earthshade, then lightly drybrushed with Golden Griffon. The green trip for 4th company is just three thin coats of Elysian Green, and the bolter casings are done with Abaddon Black and washed with Nuln Oil, as are the silver bits. Ventris’ face has caused me a lot of concern – it’s the usual Citadel scheme of Cadian Fleshtone, Reikland Fleshshade, and Kislev Flesh, but I think that last looks a bit too weird somehow. I’m still learning faces, of course, so I might change this soon. I still want to do something with the power sword, Lysane’s flamer I want to try and do the muzzle burn thing on, and I should probably add some decals to them too, so they’re not quite finished yet, but in the main, they’re done! I think the tactical squad looks great so far, anyway! 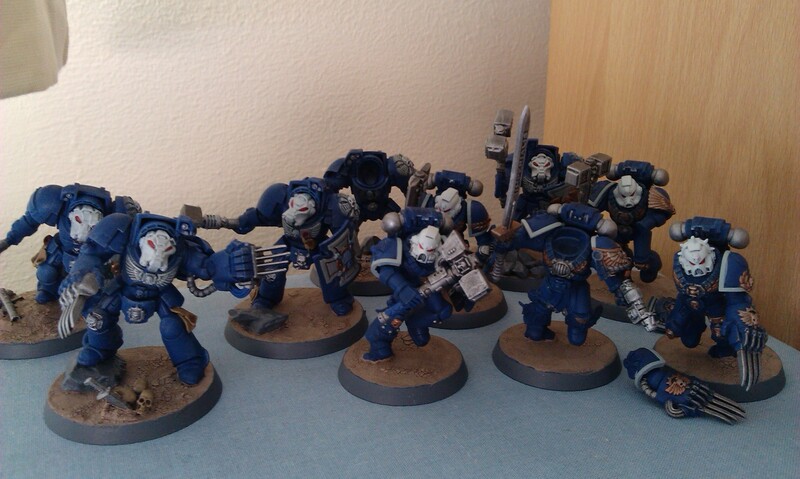 Shamefully, this is the extent of my Ultramarines army right now, also! I do have a lot of half-finished things on the go, of course, but still! Unless it isn’t obvious, since the last time the librarian appeared in my progress blog, I’ve done a lot of the tan colours on his body – all Zandri Dust, though the tabard and shoulder pad have been shaded Seraphim Sepia, while the purity seals and librarian skulls have been shaded Agrax Earthshade. 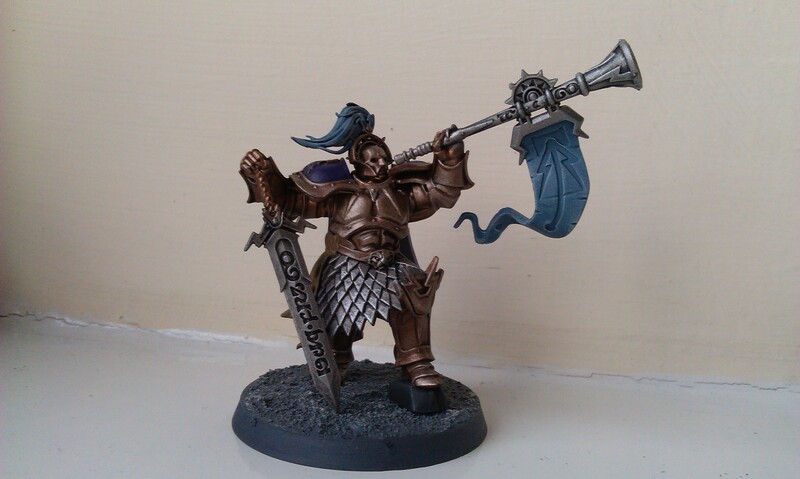 I’ve also painted his power sword, with a weird mix of Balthasar Gold and Leadbelcher. I basically wanted to see what happens when you mix these two paints, and it looks kinda nice, so I thought, why not? Finally, I’ve been working on the Knight-Heraldor, who will be joining my Stormcast on the board for Armies on Parade next month! He’s pretty easy to paint, actually, for all that he’s a character unit. The armour is Balthasar Gold, shaded with Agrax Earthshade, and drybrushed with Golden Griffon; the silver bits are Leadbelcher, shaded with Nuln Oil, and drybrushed with Necron Compound; the purple bits are Naggaroth Night highlighted with Xereus Purple, and the plume is Celestra Grey shaded with Drakenhof Nightshade. The pennant coming off the trumpet is Thunderhawk Blue, shaded with Drakenhof Nightshade, and lightly drybrushed with Celestra Grey. All I need to do is paint the hilt of the sword, and he’s finished! So that’s been surprisingly easy, anyway – I think it helps I used him to break the monotony of painting so many marines this week, which has certainly helped! So, all in all, I feel like I’ve made some excellent progress this week! As I said above, I’m going to abandon those veterans and terminators for the time being, while I figure out whether I want to actually keep them or strip them. It’s currently no great loss, of course, because my Ultramarines are hardly a force that just needed one of those units to tip them over the edge, but still! I think it’s shown me that spraying Macragge Blue might be best left for vehicles or larger things, and otherwise I’m best off just painting it on with a brush. I’ll probably end up painting something completely different to all of that, anyway!! Another quiet week this week as I’ve been working ridiculous hours prior to my week off! I’ve done one or two things, but sadly not as much as I’d like. But anyway, I’m here to talk about the good stuff that I have been up to so, without further ado, let me introduce you to my Tomb Kings! These guys have been an absolute blast to paint so far, let me tell you! After building them all up, I’ve sprayed them Corax White, which itself was a bit of a trauma as I’ve previously had really bad luck with that, but I shook it for an eternity, made sure it was really warm and stuff, and stayed about 8 inches away from my models, and they’ve turned out pretty well, by and large! There are some areas that look grainy, but it’s so much better than things like the Necropolis Knights, so that’s a good thing! Anyway. 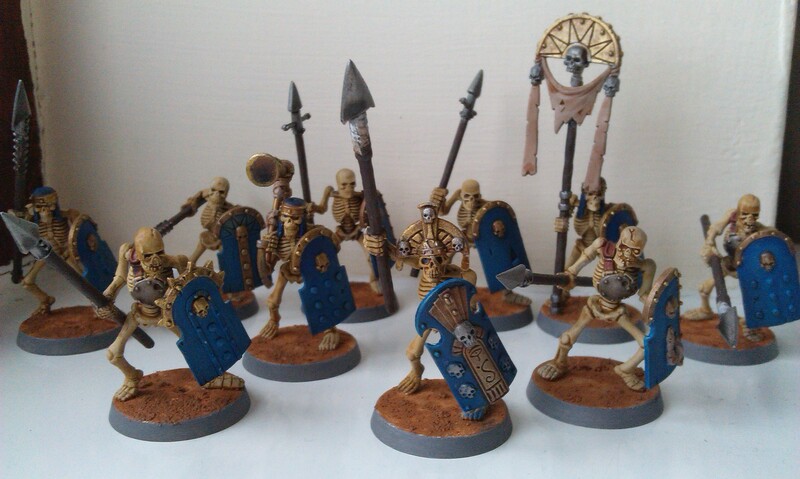 My usual method for painting skeletons – that is to say, the method I used in the one time I’ve done this previously – is to spray them white, then use Seraphim Sepia wash on them, and leave them at that. It gives a lovely aged-bone look that I like, anyway. Sure, if they’re in the desert they should be more bleached, but I don’t mind. The golden bits have so far been painted with Balthasar Gold, and not gotten much further. I’d been toying with using Retributor Armour instead, but I think, while that shade looks fantastic on the Deathwatch stuff, it’s still a bit too much for my fantasy guys. I like the idea that the Deathwatch have the resources to make their armour and equipment super clean and stuff, but these skeletons are just skeletons, you know? So I have a week off coming up and, while I am actually going away for some of it, I still hope that I can get some work done for the days I’m at home and see some models finished! As the weather has suddenly started to turn much colder, and once again poses a more serious issue for when best to prime models, I’m finding myself a bit surprised, but also really impressed that I’ve actually kept this update blog going for every single weekend! Last September, I essentially took a month off from painting stuff, so it’ll be interesting to see if I fall into that trap again, or manage to power through and keep the progress going! These guys are the last bits from both Overkill and Death Masque, and while I’d been thinking they were the ones I’d not really been looking forward to painting, now that I’ve built them, I think they’re some of the more impressive models in the range! The White Scar biker in particular looks incredibly awesome, and I love the look of Captain Artemis! I’ve been considering getting a Watch Master mini to round out my force, and then start painting this second batch, but I’m already a bit overwhelmed with minis here, so may have to split them into two groups to feel like I’m getting anywhere when I get round to them. Yep, it’s Tomb Kings time! 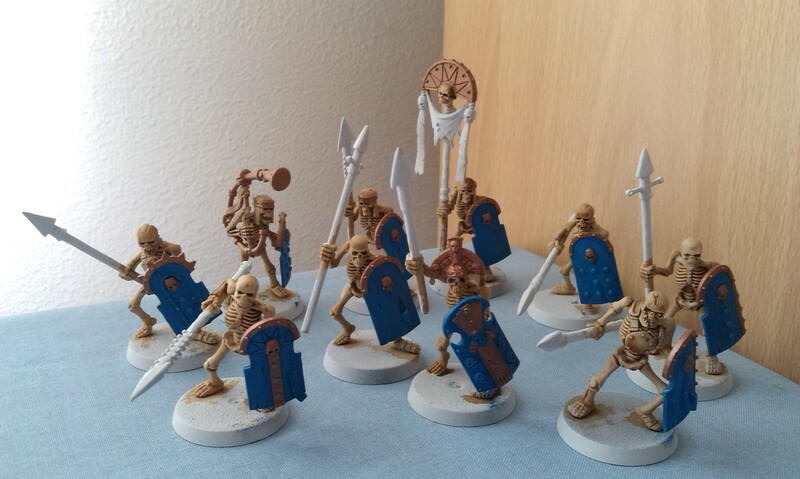 After the failure of getting the Necropolis Knights primed back in the day, I’ve gone for some skeleton warriors as I’ve been watching (well, listening) to the Tabletop Minions live shows while I paint, where Adam talks a lot about his skeleton horde army. Since taking the picture above, I’ve actually primed the minis with Corax White, and I’m pleased to say they’ve come out really well! Since talking with the manager at my local GW about the problem, and having his words of wisdom on priming, everything I’ve primed has come out beautifully smooth and clean-looking! So that’s a real success there. I’m really looking forward to getting to work on these chaps as well. I was only going to do them five at a time, but as my skeleton scheme (from the Spirit Hosts I painted up two years ago) is really easy, I thought ten is hardly going to push the limit. The scheme is basically Seraphim Sepia over the white primer, and then a little bit of drybrush with something like Tyrant Skull if I’m feeling the urge, so knocking out ten of these bad boys should be the work of an hour or two, tops! The weapons might be a bit more interesting, but again, I’m not planning to do too much with them, so hopefully it’ll all go swimmingly, and next week you’ll see ten completed Tomb King skeletons! Since doing these chaps, I’ve also been thinking about how I can rescue the Necropolis Knights (well, it’s been on my mind for months now). I feel like they’re too delicate to strip just in a the usual dettol bath, so I’ve actually been thinking of buying an ultrasound cleaner for the job. Again thanks to Tabletop Minions, Adam’s done an excellent job of putting the idea in my mind! I like it because I feel it would be more efficient at stripping the paint off, and while it seems like a weird investment for just three models, it is certainly cheaper to spend £25-£30 on a cleaner than just re-buying the miniatures on ebay! I do have a second box, though, but I need to make the most of this finite resource! I’ve also been looking at a lot of the Necrons I painted up back in the early days of the hobby – two years ago, now, in fact. If I’m totally honest, I’m not happy with them, and it’s getting to the point where I don’t really want to play with them as I’m a bit ashamed of the paint job! I’ve already mentioned how I’ve been feeling like I need to regress my painting whenever I do another batch of Lychguard, so that they all match, so I’ve been thinking about stripping the paint off of them and starting again… So I suppose an ultrasonic cleaner would come in real handy here, as I have a lot of models I’m unhappy with!! Well folks, my hobby progress blog comes of age! 21 weeks of doing stuff with Warhammer miniatures, and what a time it’s been! This week, I’ve not actually painted anything, but I have built a load of stuff, starting with the Silver Tower minis! I’ve built up all of the monsters, and three of the heroes, and actually got in a game at the weekend – keep an eye out for the write-up on Tuesday! I’ve not yet got round to painting anything, however I’m planning to do this kinda slowly and do it in stages. I’m not in any particular rush to get them done, I’m used to playing games with unpainted minis, after all, but I do want to get them done soon. Stay tuned for progress here! Finally, as if building up almost 50 miniatures for the game, I’ve also done these guys! I am so excited about getting these built – I wrote a blog a while ago saying how I’d always wanted to have a Tomb Kings army, and I’m finally on the way to making this happen! The Necropolis Knights are probably my favourite of all those I managed to get my hands on during the Last Chance to Buy thing, so I’m really pleased to see them come together. Let’s see what these four months will bring! 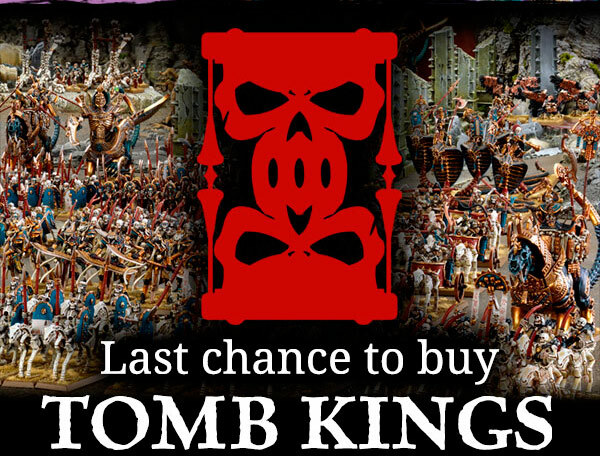 So this went up over the weekend, and it seems all hell broke lose across the internet, between long-time Tomb King players feeling like Games Workshop had given them the hard end of the stick, and folks pretty much like myself, who had always wanted to start a Tomb Kings army but had never quite gotten round to it. Within hours, things started selling out completely on the website, and at the time of this writing, there are just a few bulk-type things left for sale. As I said, I’ve always wanted to start a Tomb Kings army, but a combination of being distracted by other models, and a little nervousness over so many fragile-looking skeletons has always put me off. Seeing them go has prompted a bit of nostalgia in me, so I thought I’d take some time today to write a bit of a rambling blog about all of this. I’m not sure if I’ve talked much about this on my blog in the past, but I still think of myself as pretty new to this Warhammer lark. It’s an IP that I’ve always had some sort of awareness of, but have always been a bit reluctant to delve into properly – having always been a huge Star Wars fan, I have felt there isn’t enough room in my head for two big IPs! So for a long time, I was on the outside looking in, always fleetingly. Then in 2010 or 2011 I bought into a card game called Warhammer: Invasion. It’s a Fantasy Flight LCG that was discontinued back in 2014, set in the Old World and featuring the usual dwarves, orcs and elves. I’d recently gotten heavily into the Lord of the Rings game, and bought this as a bit of light relief, but enjoyed it so much that I snapped everything up, and started devouring everything I could get for it. There was something about that Slann Mage Priest that really intrigued me! 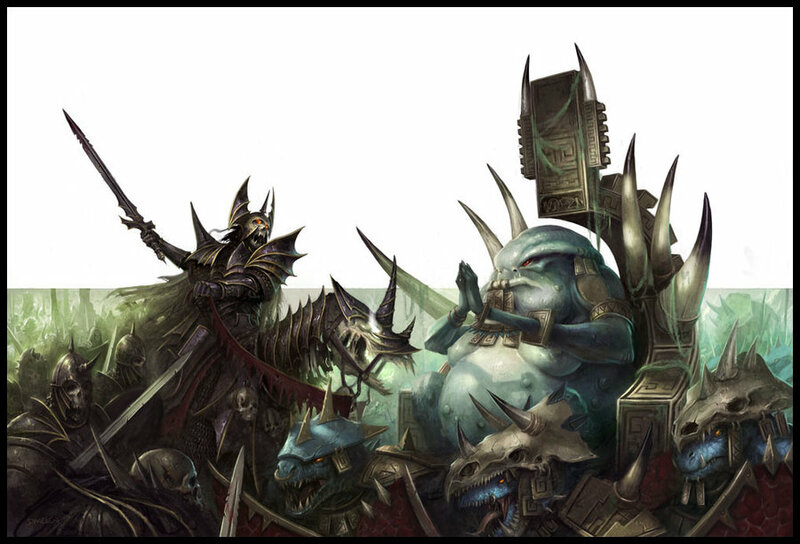 This art adorns the box for a deluxe expansion called March of the Damned, which introduced new factions to the game, Vampire Counts and Lizardmen. Around this time, there was a thread on the official forums asking what other factions people would like to see, and Tomb Kings really stood out to me as an intriguing name. I mean, I knew what to expect from Ogres and the like, but was interested to see what these things could be. I’ve long been interested in Ancient Egypt, and Tomb Kings draw heavily on that aesthetic. Or, more the kind of Hammer Horror-esque The Mummy and that ilk. While there are of course legions of skeletons that wield weapons, the characters were all bandage-wrapped horrors, though the overall look is really very appealing to me. I think the idea of the undead with all that gold on them is what really drew me in! But I never bought them. As a kid, I remember one Christmas having a model spitfire as a present, and my older brother had a model messerschmitt. While he managed to put it together, and I seem to remember him painting it and adding transfers and all sorts, I was deeply dissatisfied because it wouldn’t go together like a Lego set. I was about 5 at the time, I should add! But I always remember the failure with this airplane, so when I was one those fringes of Warhammer, I was forever thinking of my lack of modelling skills. When I eventually got into Warhammer models themselves, back in the summer of 2014, I moved almost instantly to 40k, a game I never thought I’d play, and went through a series of Necron kits – Necrons being space Tomb Kings in all but name, of course. When it came to collecting models for Fantasy (as it was still called then), I actually bought Ogres (and Lizardmen, but we won’t talk about them…) Tomb Kings were still not on my radar. Throughout all this time, which saw me collecting space skeletons, Tomb Kings still somehow scared me. In writing this blog, I think I’ve finally realised why: rank and file. Looking at the pictures on the website of all those models ranked up with their bows and their spears and their goodness-knows what else, I think a little bit of 5-year-old me resurfaced, and I lacked the patience to put something together that looked just far too fiddly. Age of Sigmar came out and I was bowled over by the Sigmarines, and it’s taken the withdrawal of the entire range to finally get me to invest in the models! So I’ve finally taken the leap and have bought a decent amount of models – by my rough estimate, 202 wounds of the buggers – that I really can’t wait to turn into my next army! I’m still hoping I can get myself a Battalion box, another, what, 61 wounds right there! I guess we’ll see how the rest of the month progresses. As a postscript, this is my 399th post on this here blog, and the 400th is right around the corner! It’s a little something that I’m looking forward to starting, anyway, so stay tuned! Author spalanzPosted on February 18, 2016 Categories WarhammerTags Age of Sigmar, Games Workshop, miniatures, Tomb Kings, Warhammer1 Comment on Tomb Kings extravaganza!